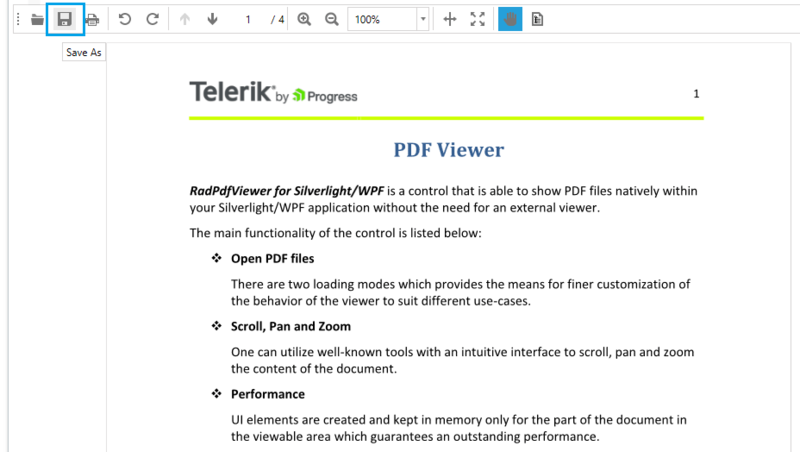 RadPdfViewer enables you to save the loaded document to a file on the file system. This functionality can be easily wired to the UI using the related command descriptor or silently invoked through the exposed API. The Save As functionality is available as of R3 2017. When invoked, the SaveAsCommand opens the SaveAs dialog and writes the document loaded in RadPdfViewer to a new file on the file system. The new document is then loaded in the control. If there are changes to the document, the command adds additional bytes to the original PDF file in order to preserve the changes. For example, if some interactive form field values are modified through RadPdfViewer UI, then the SaveAs command will preserve these changes in the new PDF file. When the document is not modified, the command saves the original file stream without modifying it. Currently, this command has a limitation when working with encrypted documents. No changes can be saved when the original PDF file uses encryption. Similarly to the other commands of RadPdfViewer, the SaveAsCommand can be wired to the UI using its command descriptor. Example 1 shows how you can set up a button to execute the save operation when clicked. The SaveAsCommand always shows a dialog to the users so they can choose a location to save the file to. If you would like to save the document without allowing interaction with the user, you can take advantage of the Save() method exposed by RadPdfViewer. The method takes a Stream as a parameter and directly saves the document of RadPdfViewer into this stream.